Fig. 1 The Earth III, by Adrian Morris. 1978. Oil on board, 91 by 81 cm. (Courtesy of The Estate of Adrian Morris; exh. Galerie Neu, Berlin). Fig. 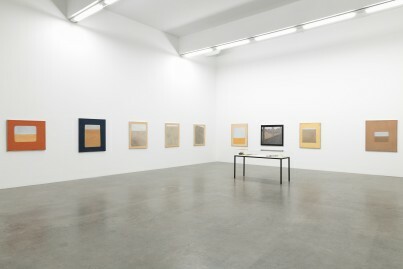 2 Installation view of Adrian Morris, works 1956 – 2004: a selection by Tenzing Barshee, Galerie Neu, Berlin, 2019. Fig. 3 Distant Landscape, by Adrian Morris. 1975. Oil on board, 91 by 81 cm. (Courtesy of The Estate of Adrian Morris; exh. Galerie Neu, Berlin). Fig. 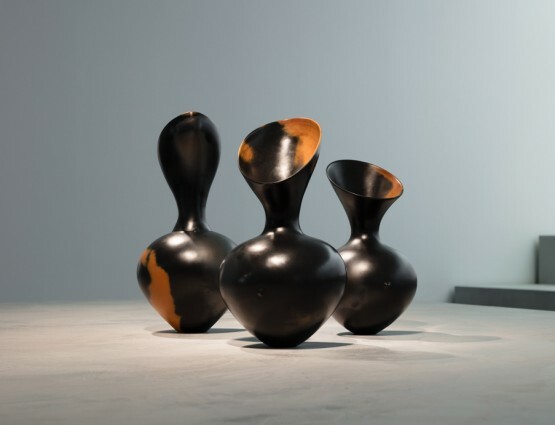 4 Installation view of vitrine from Adrian Morris, works 1956 – 2004: a selection by Tenzing Barshee, Galerie Neu, Berlin, 2019. Fig. 5 Irrigation II, by Adrian Morris. 1964–66. Oil on board, 63 by 81 cm. (Courtesy of The Estate of Adrian Morris; exh. Galerie Neu, Berlin). Fig. 6 New Foundations, by Adrian Morris.1966–67. Oil on board, 63 by 81 cm. (Courtesy of The Estate of Adrian Morris; exh. Galerie Neu, Berlin). During his lifetime Adrian Morris (1929–2004) had one major exhibition. In 1978 as part of the Hayward Annual he was given a room. 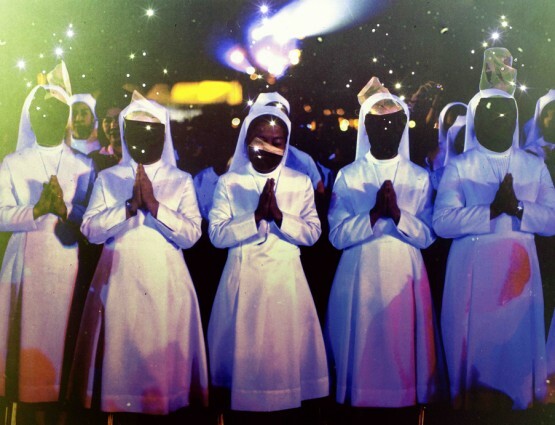 He had been invited by the artist Liliane Lijn to show sixteen of his paintings. She was the instigator and one of the five selectors of the exhibition, all importantly women, who had come together to redress the persistent institutional bias against female artists in Britain at the time. Morris along with five other male artists were, somewhat surprisingly, included in the exhibition, each representing what was referred to as a ‘marginal position’, and each included to open up the exhibition from segregated readings. Many of the paintings Adrian Morris exhibited at the Hayward Gallery, London, together with others that have been gathered for the first time, are now hanging in the Gallery Neu, Berlin. The selection and installation of these paintings by the curator, Tenzing Barshee, is faultless. It emphasises the classicism in Morris’s work and that he is a painter who has a subject. The paintings are always modestly scaled, on board and painted in tough, hard-won oils. The surfaces of the work capture both Morris’s use of multiple layers of paint – sometimes built up over many years – and his care in application as well as perhaps a physical and psychological strength. A strength that is turned to Morris’s vision of empty aerial landscapes, deserted rooms and brutal architectural frames. In three of the boldest paintings in the exhibition The Earth I (1975), The Earth II (1976), and The Earth III (1978) FIG. 1, Morris painted a horizon line seen through an opening. The paintings have been hung smartly in two separate rooms, playing with sightlines and the architecture of the gallery, as the series is split between two adjoining rooms FIG. 2. The three works are very similar, and hint at a view through a window or man-made aperture. 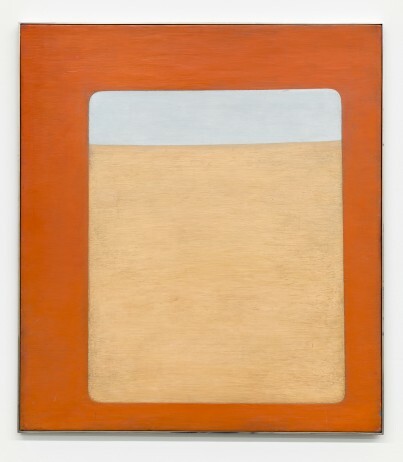 A division between land and sky painted in bright vermilion and desert-like earth colours. The paintings in their emptiness emanate light. They are pared back, unpopulated by people, with a stillness that seems to express a deep sense of geological time. They are concerned with viewing – how we view – the frailty of the earth and the vulnerability of the planet. Although they give the impression of being geometric, minimal even, the angles are always slightly off-kilter and echo the oblique surreal geometry of Giorgio de Chirico’s empty haunted piazzas or the reductive tendencies of Giorgio Morandi, rather than that of Ellsworth Kelly or later hard-edge abstraction. 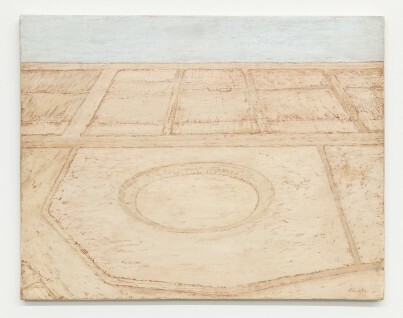 In doing so Morris creates a unique position, melding aspects of European Modernism to impassioned environmental and ecological concerns – concerns in tune with artists such as Robert Smithson, whose theories of sites and non-sites date from around the time of these paintings. Intriguingly, although he was British, Morris as a young evacuee in the 1940s had a cultured American adolescence. There, through his family’s connection with the poet John L. Sweeney, he met many displaced European artists resident in Manhattan and even spent a transatlantic crossing with T.S. Eliot, whose nervous preoccupation with literary and contemporary allusions, quotations and displacements seems deeply connected to Morris’s own future paintings. In Distant Landscape FIG. 3 Morris paints his aperture as a porthole-like circle. With a dark exterior the circle is simply split in two, not quite bisected evenly along the horizontal, to create one of his most abstract compositions. 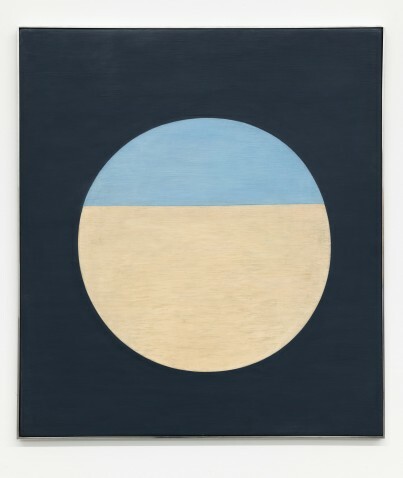 Comprising of just three colours, black, blue and a sand-like beige, the painting reveals its slow creation in its smooth, thick, brushed handling. With its straightforwardness of form, the edges of each colour become imperative and hold a depth of paint that makes visible incisions from the paintbrush’s bristle. Hidden within this form, however, is a shadow: an echo of a figure standing in the bleakness, overpainted and erased. And this spectre, which is barely detectable, reveals the genesis of the work and much about Morris’s technique. For in a photograph of the painting in a nearby vitrine FIG. 4, one can see a standing figure, a young black youth gazing out. It is a refugee, who Morris painted from a newspaper cutting. It is, if you like, a glimpse into the socio-political origins of all his work. And as such these abstractions – if that is what they are – hold a conviction beyond their mere formalism. Its partial reveal is not reticent but necessary, integral to the works construction. Indeed, the formal structure of Morris’s apertures – whether circles, ovals or rectangles with rounded corners – appear to come from a distillation of observational drawings. A sketchy drawing of an astronaut is also in the display case and points to Morris’s fascination with the Apollo missions. His is perhaps a visored vision: from the inside to the outside. In the upper galleries, paintings such as Irrigation II FIG. 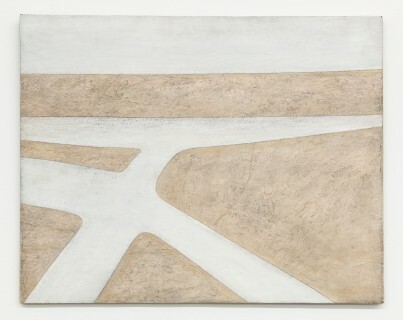 5 and Flood Plain (1965) show an actual human presence, with Morris depicting aerial landscapes cut through with schematic canals or waterways. The literalness of these paintings – and there are others from the same period showing empty filtration plants, or a building’s foundations cut into the soil FIG. 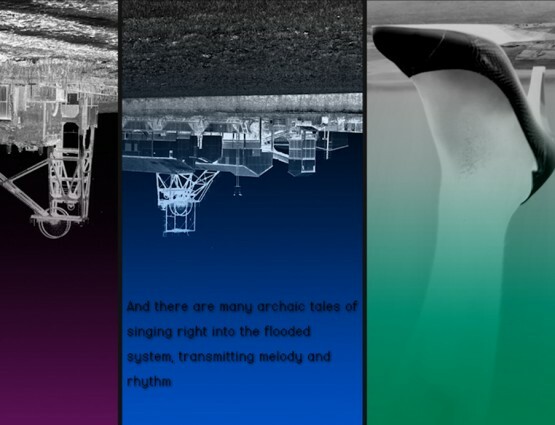 6 – are haunting and poignant, pointing as they do to the necessity and politics of land, water and its management. In one of the last paintings in the exhibition, Compound (1998), Morris paints the shell of a set of empty concrete buildings in Cambodia. Quiet and stoic this architectural composition is again drawn from a newspaper photograph. What sort of compound could it be? Resembling a military facility, could it be from Pol Pot’s Khmer Rouge? The exhibition at Gallery Neu is the first serious exhibition of Morris’s work in a commercial gallery for over ten years and follows a number of influential exhibitions that have been organised and championed by a group of younger British painters in London and Glasgow. These artist-run projects, all in not-for-profit galleries and project spaces, began with an exhibition organised by Merlin James and Carol Rhodes at Carlton Place, Glasgow, in 2015, and there is an insightful interview with James and Barshee available in the current exhibition in a fold-out poster. Subsequent showings of Morris’s paintings took place in London at LONDON (2016), Le Bourgeois (2018) and at Camberwell College of Arts (2018), all rather wonderfully, like Galerie Neu, austere brutal buildings. What all these exhibitions and the current one make so abundantly clear is that Morris’s paintings resonate profoundly today and express beautifully and individually painting’s ability to speak elegiacally to specific contemporary concerns – to migration, to the environment and to the way we choose to inhabit the world. Daniel Sturgis is a painter and Reader in Painting at the University of the Arts London.